It is never easy to change tutor at assignment 5 but this is the situation that we find ourselves in. The task has fallen to me to give you feedback on what you have produced for assignment 5. You will have to bear with me as I have not seen anything of what you have done until this point. Due to my tutor not being available until further notice because of family matters I was contacted and asked whether I would need a replacement tutor. So close to the end of my first course I thought it was important to find a replacement tutor. There was an extreme contrast between my previous tutor feedback’s which can be viewed below and this one. I see that you have chosen Option 4, the figure. 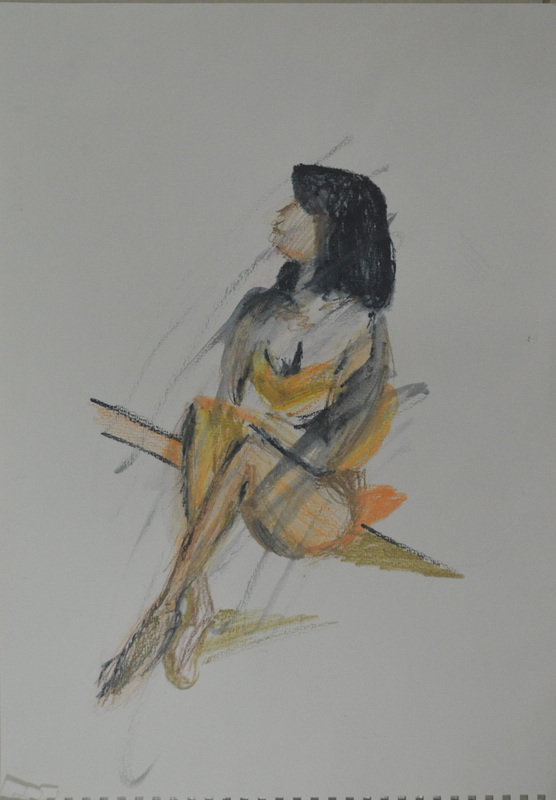 Students can often find it difficult when working from the figure mainly due to preconceptions as to what a drawing should look like and particularly a work made from the figure. 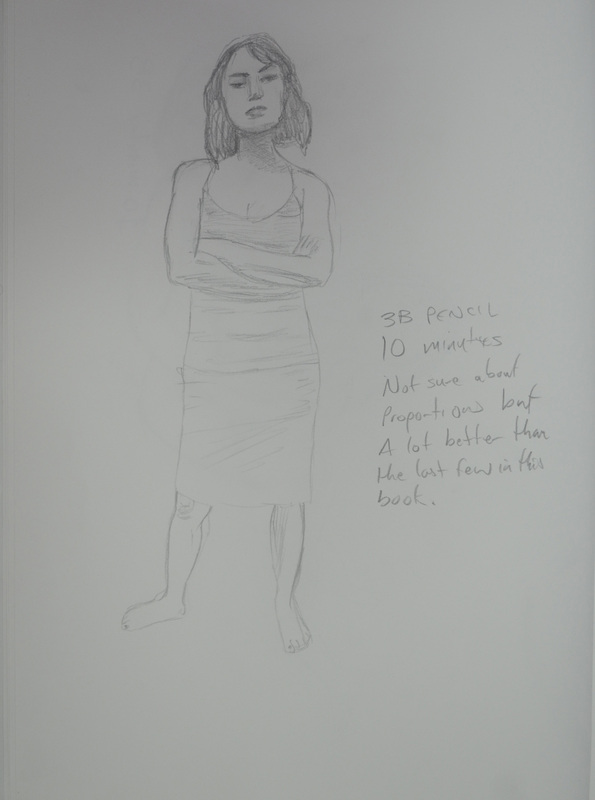 For the most part the quickly made drawings in the quick sketches work are weak; you have generalised far too much instead of drawing what you have seen. This has resulted in some poor understanding of proportion and how bodies engage with the space around them. The interpretation of the hands and feet in this series of work needs thinking about. It is important to make changes as you draw correcting and changing to get the whole operating cohesively. Writing on a drawing what is wrong with it or what needs to be done to it will not benefit you at this stage. Change the drawing! I agree that some of these quick studies were weak, out of proportion etc and said so in the learning log. Others were strong with a 100% resemblance and correct proportions. What needs to be realised here is that I am drawing figures of a ‘different race’, i.e. If I was drawing Japanese models, legs would be shorter. I made notes on drawings before making a fresh, I was drawing quick and so I thought this was a better approach than spending so long editing the drawing. These notes helped me to capture my thoughts at the time. Varying the speed that you draw can often open up new ways of seeing as can holding your drawing implements differently or using your ‘wrong’ hand. Quickly executed drawings can be good and bad. Drawings made more slowly likewise. It is the intent and nature of the outcome in reference to what your subject is and the quality of the drawing itself that matters. Now interestingly the batch of ‘more gesture’ drawings mostly made in pencil are really well seen and interpreted for the most part; working quickly has worked for you here! The works from the female model are full of life and movement; the proportions are very believable as is the weight distribution through the figure and the stances in general. Some of the male studies demonstrate some good understanding of foreshortening through some quite difficult poses. My idea of a gesture drawing and a quick study are two different things. For me a quick study is a quick study in the style of my ‘would be’ finished piece, if he had looked at the previous assignment he would have seen the quick studies were closer to the way I finish a drawing. However, the ‘more gesture’ drawings were more satisfying and so maybe I am looking in the wrong place to find myself. It is imperative that you look hard at all times at your subject; look draw, alter, draw again, change, look, you need to build up a dialogue between yourself, the subject and the particular medium that you are using. Different media require different approaches as do different subjects. It is good to build your drawings in this way. You included lots of work which in itself is fine, however, it is very important to us some objective discernment both as you are working and as you look at a completed body of work. Interestingly the drawing in line of the ‘woman playing with her phone’ is the most successful of this group of works. The proportions are fine and come together and form a believable figure in action. You have this marked as ‘out of proportion’, it isn’t! This tells me you are not seeing things clearly enough as you look; look at this drawing closely and try to recognise how you have articulated the figure in space; how well the head sits; how you have changed sizes of parts of the body as they recede (foreshortening in other words). You have been looking here and not generalising. The shaded version of this pose is not as successful as the line version; it is stiff and lifeless by comparison. I will talk more about discernment later in the report. 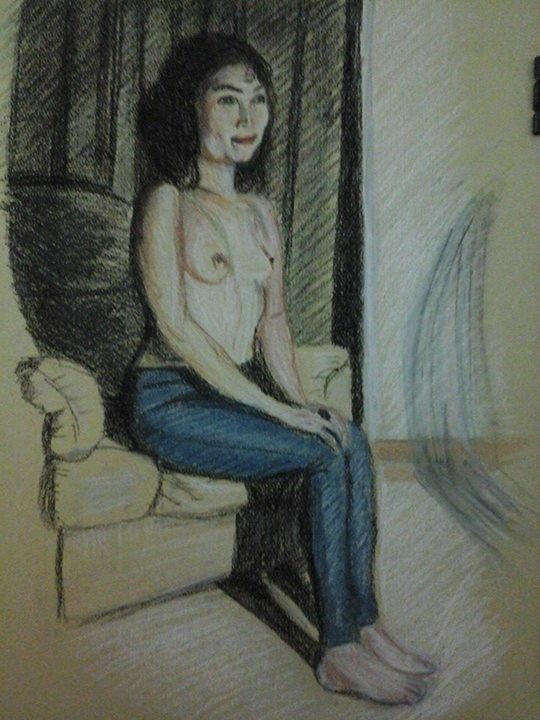 I have to disagree here, this drawing was from a photo as I didn’t have time to do a life drawing in this pose. My girlfriend is only 5 foot and the second drawing is ‘spot on’. I like the first drawing in just line but it is as I said out of proportion. The tonal studies revert back to generalisation for the most part; you are forgetting to ‘look’ here and are trying far too hard to make a picture instead of investigating your subject. As a result proportions are out again; heads too big, feet and hands and legs too small. Some of the drawings are somewhat kitsch also which is a look you should avoid at this stage in your development. I submitted drawings here that others would have left out, mainly because the folders I have submitted digitally from my computer contains everything. Below is a photo of a very spontaneous easel drawing that was neither planned out or marked. It shouldn’t have been submitted but it was and as since been omitted from my learning log. However, there are positive drawings in this exercise, that were not generalised, were not drawn quick and were a result of looking. The tutor has nothing positive to say about any of these and that’s annoying. The ‘kitsch’ he talks of is a result of depicting tone using colour, the results were spontaneous not planned. I will be reproducing this in charcoal pencil. The work that you did for the assignment piece itself is actually much better. The understanding of proportion is better and the use of tone is quite successful also. The ‘looking at the door handle’ in water soluble pencil looks to be working better than some others as does the more expressive version in watercolour pencil which you have marked ‘Sad Attempt’. The expression that this study has could be pushed even further. The tutor and I obviously have different tastes, styles and understanding of what I was trying to do in this assignment, the above drawing was not it. The larger drawing is a reasonable resolution on what you were trying to do. The sense of isolation within the figure is present and the pose supports the idea also. The relationship of the figure to the background maybe needs some more attention to get the areas of the drawing reacting together more. Maybe the figure looking at the door handle would be sufficient as a concept to carry both the pose and idea. The pastel one maybe over done. It is always good practice to work on more than one version of assignment pieces; this will give you much more scope to select when the time comes and it will also help you explore your ideas and methods more also. Remember this for the future. I wasn’t trying to create a sense of isolation within the figure, I was trying to create a feeling of anxiety and fear, which I think the oil pastel, ‘over done’ drawing did well. 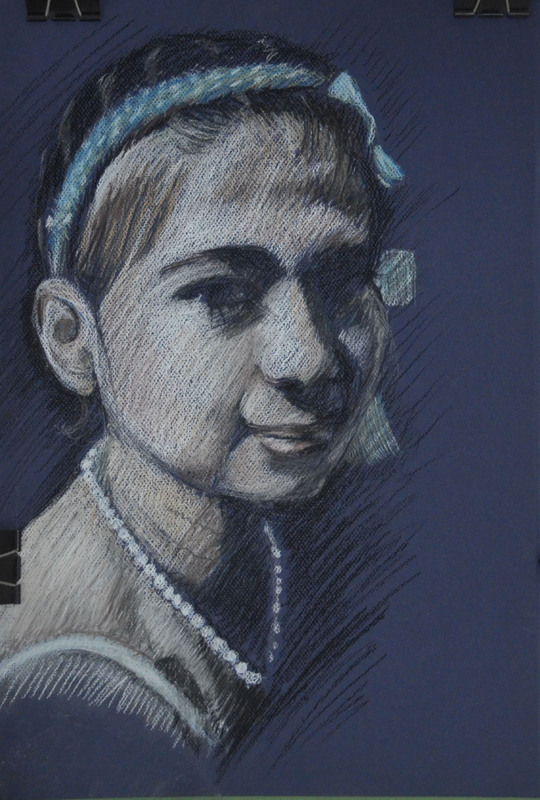 The larger drawing in Gouache, watercolour and watercolour pencil was a second version of the assignment piece and if I preferred it to the oil pastel would have been submitted as such. I presume that you have been keeping sketchbooks through out the course. The more investigative the more useful they will be. Bear this in mind for the future. The blog is far too descriptive. You need much more critical comment on what you look at and indeed more of an in-depth comment on your practice and methods. Say more about why more often rather than how. More comparative statements about the quality of your work and how you think that you could improve it. It needs to be less descriptive and more of an analytical tool that you can use in your practice in a real sense. This should have been pointed out to me at an earlier stage instead of getting pats on the back, is it too late to change? Generally a learning log/Blog should contain objective and comparative comments on your own work and development. Comments on work of other artists relevant to what you are doing. Evidence of art you have seen, in the flesh in books or on the web – with images, annotated where necessary. The log should also contain the set theoretical studies from the course and your tutor reports. Look at drawn figure work by Manet and Cezanne to see how they use their media fluidly and openly, Seurat’s drawings are good examples of inventive use of tone. Look at Degas for his use of pastel and inventive composition and Van Gogh for his use of mark making and line. Picasso and Matisse have both made exhaustive drawings in line which would be beneficial to see as would some of Rodin’s work from the figure in line also. Discernment is going to be very important for you as you select for your assessment submission. You will have to do this as I can see that you have a lot of examples of work some of course more successful than others. You need to pick out the more successful work. Some of the work throughout a all five assignments will not be quite as successful as others so you will need to select well. Look through all your reports to help you select. Spread all your work out in front of you and remove the less successful ones until you have a coherent group which satisfies the submission criteria. Put the best drawings in as the assignment pieces i.e. re designate them if you need to. Pick out your most successful pieces as support work also. You will find the submission criteria in your course book and check out the OCA website for tips on submission. You need the right balance; not to much but not too little either. Present your work in its best light.